You can train your beagle perfectly on your own at home – but by taking your beagle to obedience training you learn a few things you didn’t already know. It could be one of the smartest things you ever decide to do for your beagle. Read on to find out why! It is a difficult decision to make – to take your beagle puppy to obedience school or to only train them at home. If you do decide to train your beagle at home, that is perfectly okay. However, beagle obedience training may be able to fast-track the process for you. And you never know – you could learn a few more things that you didn’t previously know about. Here is an idea of what you would expect to learn from beagle obedience training. This information will help you decide if beagle obedience training will benefit you. At beagle obedience training the first thing they will teach you and your beagle are the basic commands. 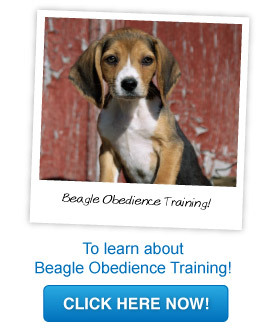 But not only will it teach your beagle these new commands, you will also learn how to deliver those commands. A lot of people think that the training is just up to the beagle; however this is not the case. Both the owner and the beagle need to work hard. The owner needs to learn how to give the commands correctly and the beagle needs to learn how to respond to those commands. If you come to obedience training with this knowledge, you will have a much more rewarding time. Leadership: This is where you learn how to show your dog that you are the one in charge, that you are the alpha leader and that you are the person they need to listen to you. If you follow these same rules when you are home your beagle will be much more obedient and listen to your commands more easily. Learning how to be the alpha leader is the most important thing you will learn at beagle obedience training. It will make the process of training a lot easier. The Basic Commands: The common basic commands your beagle needs to learn are heel, speak, sit and quiet. These are the commands you will use most throughout you and your beagles relationship. If you teach them these three commands first, it will be much easier to train your beagle later on with more complicated commands and tricks. Biting and Barking: The biggest problem you may face with your beagle is biting and barking. At beagle obedience training they can help you fix these problems and teach you the skills to deal with them. These problems need to be dealt with when your beagle is a puppy, before it gets out of control. So if you are having trouble with your beagle biting and barking it’s probably best to enroll at beagle obedience training. As you can see beagle obedience training could really benefit you and your beagle. It will help you learn the basics and how to overcome any problems that might occur. Beagle obedience training is only the beginning. You might learn the basics but if you do not continue what you have learnt once you get home, then you may lose control of your beagle. You also need to teach your family what you have learnt at beagle obedience training. If they follow the same methods you have been taught then it will be much easier for your beagle. Consistency is the key for a well-trained beagle! And remember to also show your beagle at all times that you are the alpha leader. So, if you are having trouble training your beagle at home or just want to learn a few new things then enroll in beagle obedience training. Trust us, it will definitely be worth it!